Today I have a FREE Ancient Egypt coloring page for you featuring the ancient Egyptian god Osiris. Get out your colored pencils! Osiris is one of the famous the ancient Egyptian male gods. He is the god of the afterlife and of rebirth. As you color in Osiris, check out the facts listed on either side of him. You'll find out all sorts of fascinating things. 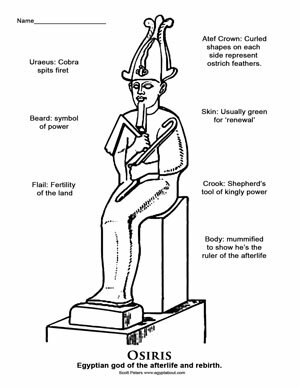 For instance, did you know that Osiris is usually shown having green skin? It's true. He was thought to have skin the color of fresh new plants because he represented renewal. We've included information about the Atef crown, the crook and flail, the color of Osiris's skin, and more. Learn while you color.